Facebook’s experiment with semi-anonymous social networking centered around interests, via a standalone app called Rooms, failed. But the learnings from that earlier experiment have now popped up in Facebook’s Messenger application as a new feature called Rooms, which is rolling out now in select markets. The limited launch is meant to serve as a test to see if Facebook’s messaging platform could encourage broader, more public conversations focused on specific topics. There were already hints that Facebook was planning to trial Rooms on Messenger in the near future. In September, code was discovered hidden in the Messenger app that referenced a feature by the same name, which also offered some explanation of how Rooms worked. 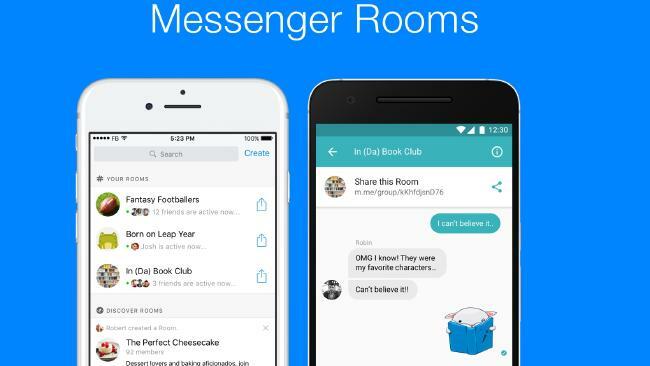 Users could also create their own Rooms via the Messenger app, invite members, approve new members, set a nickname for themselves, configure notifications and more. Facebook said then Rooms was a small test, but offered no further comment. Now, Rooms is becoming available to a wider audience: Australia and Canada. These countries are often places where the social network trials new products because of their English-speaking user bases, before rolling out the feature to the U.S. and other international users. According to Facebook’s explanation of Rooms at launch, as reported by The Courier Mail, the feature is different from group chats because it’s focused on chatting around specific topics with people you may or may not know. Group chats, meanwhile, are only generally joined by family and friends you do know. However, users will be able to set Rooms to private, and only allow those to join when they are approved by an administrator. This could work well as an add-on for things like larger Facebook groups, where not all the members are also Facebook friends. (Or have even met in real life). But it could also help connect people around subjects they want to discuss via messaging, instead of the more formal structure of a Facebook group. Another use case could be organizing events or sending out alerts. That’s something that could be especially interesting in light of how the larger social network has already been used to organize social and political movements — including, most recently, the anti-Trump protests that are occurring across the U.S. The company has been busy trialing a number of new messaging experiments in recent weeks, many with the goal of challenging Snapchat. This has included a Snapchat Stories clone called Messenger Day, which was also tested in Australia and a Snapchat clone for emerging markets, Flash. It has also tested new features for its own in-app camera on Facebook itself, as well as in Messenger. Meanwhile, its Instagram app rolled out its own version of Stories, and WhatsApp has been testing a Stories clone called Status. Facebook confirmed to us the Rooms feature has just begun rolling out to Australian and Canadian users. At this time, only users in those regions will be able to create Rooms.